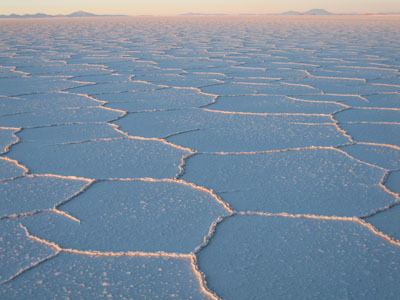 At 10,582 square kilometeres and 3,656 metres above sea level, the Salar de Uyuni is the largest salt flat in the world. Yet, across this massive bulk, it varies in height by only a single metre. This vast, flat land of pure white salt combines with multi-coloured lagoons, volcanic mountains, tree-like rocks and towering islands of coral to create one of the most unique and bizarre landscapes in the world. 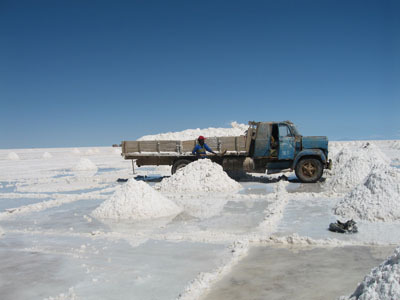 The Salar was once a salt-enriched lake. When it became cut off from the sea, the water evaporated and left the flat plain which exists now. During the wet season, Lake Titicaca overflows and floods the plain. Only a few inches deep, the water mixes with the salt and becomes perfectly reflective of the sky above. 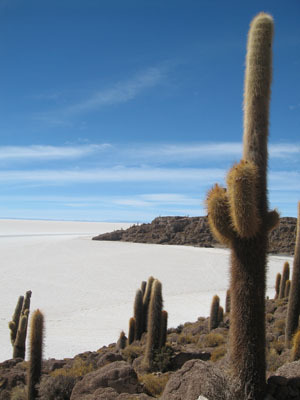 The Aymara peoples of the region call the area the 'Salar de Tunupa' after one of the giants they believed created it. The story concerns three of the volcanic mountains which surround the Salar; Tunupa, Kusku and Kusina, which the Aymara believe were once giants. Tunupa and Kusina were married but Kusku fell in love with Kusina and ran away from his wife. Broken-hearted, the giant began to cry whilst breast-feeding her child and the salt tears mixed with the breast milk, forming the Salar. 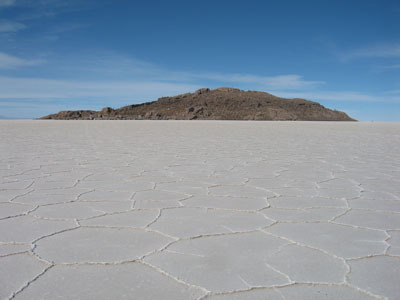 Some of the sights within the Salar include: Isla Incahuasi, the top of an extinct volcanoe which has been crusted over with hundred years old giant cacti, algae and fossils and is home to rabbit-like vizcacha and culpeos (Andea foxes), and Ojos de Salar, where water bubbles up through the salt. 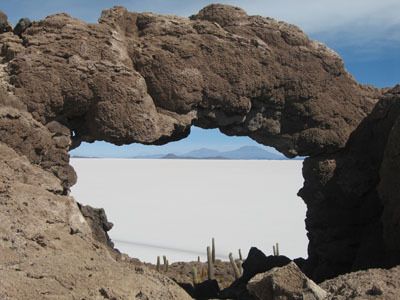 Für Information über Touren in den Salar de Uyuni und das anschließenden Eduardo Avaroa Naturreservat, bitte klicke hier.